Let's make pasta with using tomato sauce we made before. 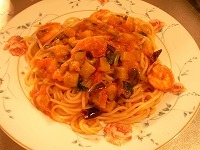 I'm going to introduce about "Tomato pasta with shrimp and eggplant " on this page. Of course we'll start with basic of Italian food. 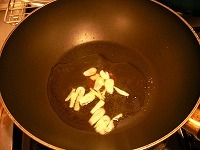 Soak the garlic taste into oil and it is enough when the garlic color changed to the yellow. We don't eat red peppers, but this is for flavor of pungent. 3). Peel the shrimp skin and cut the backside a bit. 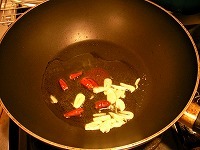 This will change the shrimps shape more beautiful after frying. Don't forget to remove black thing from back of shrimp. This black thing is a digestive organ of shrimp. 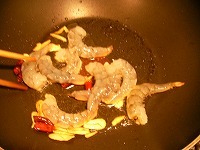 It includes feces and foods, which this shrimp ate before, and this will affect to the bad smell to the sauce. Fry it while the shrimp becomes red. 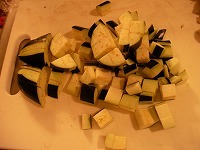 Eggplant will gradually change to transparent color when the olive oil soaked into it. 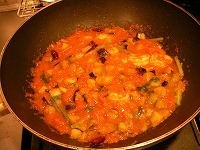 It is better to adding a green color in tomato sauce. 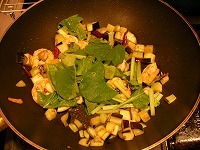 Usual spinach is also can use for it. If you have freeze tomato sauce, defrost little bit and then you can put it in the pan and melt it by the heat too. 8). 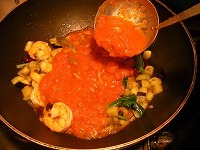 If you finish mixing tomato sauce, add some salt and pepper and adjust the taste. It's still not added any seasoning in this tomato source, so you can adjust taste with using salt, pepper and Tabasco. 9). After started boiling sauce, add the pasta. If the sauce warmed up, add the aldente pasta in it. This pasta must be made while preparing tomato sauce. Important point is to serve the pasta in the same time of this process 9). 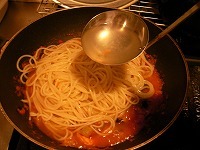 If the pasta completed too fast, it'll exhausted quickly and tomato sauce is also not recommended to serve too fast. Cooking speed is depends on the person, so please find your own timing to start boiling pasta while making sauce. 10). Add the pasta soup into 9). Warning: Do not waste the pasta soup into the sink. Reason of adding this pasta soup is because ingredient of soup has protein and this will help oil and water to combine easily. 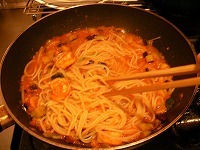 It's mean, add the pasta soup for become mixing better between pasta and tomato sauce. 11). Put on the plate and decorate it. 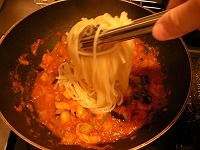 Hand made tomato sauce pasta is definitely delicious, with sauce will soak into pasta. 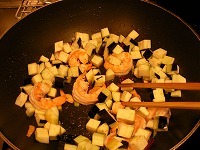 It is really healthy because it's including olive oil and many vegetables too. I'll recommend you to try this recipe once.